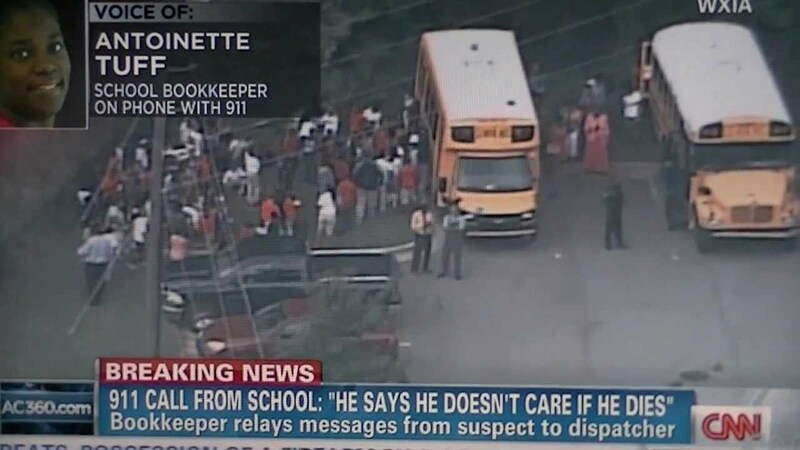 BREAKING NEWS: Tuesday morning Aug 20, 2013, as students were returning for the new school year, a 20 year old man armed with an AK-47 assault rifle, assorted guns and bags of ammunition walked into McNair Discovery Learning Academy in Decatur, GA, a suburb of Atlanta, with the intent to kill. McNair has a system requiring visitors to be cleared and buzzed in, but the gunman gained entry by slipping in behind someone authorized to enter. He went straight to the office and told Bookkeeper Antoinette Tuff to call the police and local TV station – he wanted them to film as police die. He intended to kill everyone. He was not kidding. He had nothing to live for. “He told me he was sorry for what he was doing. He was willing to die,” Tuff said. He fired several rounds at the police as they arrived. The police fired back. 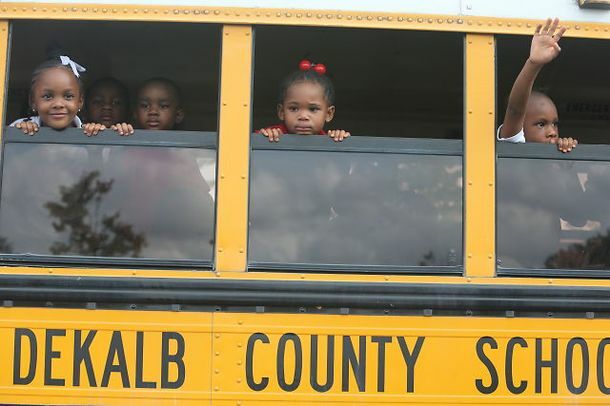 There were over 800 children from pre-kindergarten through fifth grade in McNair at the time. Luckily, the fast-thinking, calm-reacting Bookkeeper was able to talk the gunman into surrendering his weapons and eventually himself without injury to anyone. The young man was bi-polar, off his meds, and felt as if ‘no one loved him’. Ms. Huff convinced him that she did. And after a few tense hours, it was over. The shooter was in custody, the frightened children were returned to equally frightened parents, and the school is now a crime scene. We were lucky this time thanks to the actions of Antoinette Huff. What about next time? It can happen again. I just witnessed that it can happen here. Will you wait until it happens in your school? Every day I post several articles about gun violence and the resulting death tolls. Today’s post concerned an Australian baseball player out for a jog in an Oklahoma City neighborhood who was shot and killed by three teenagers who decided to kill someone for fun – because they were ‘bored’. Another concerned a three year old Michigan toddler who shot himself in the head with a loaded handgun he found in a bedroom closet. 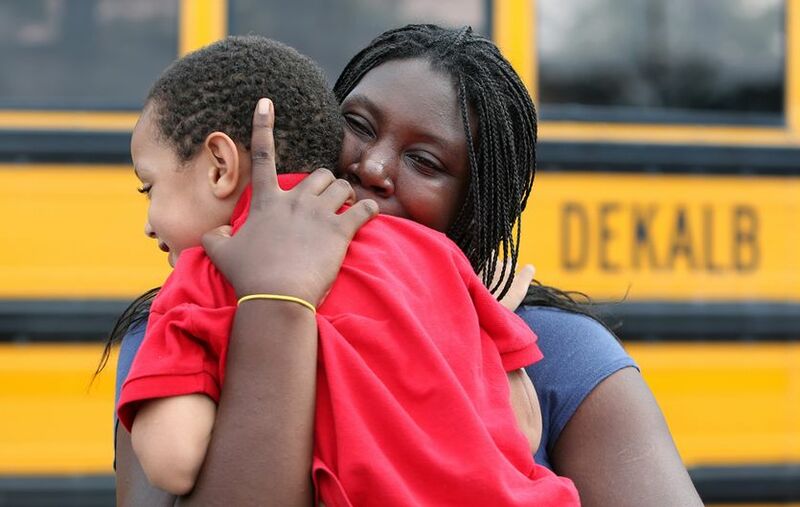 As of June 2013, there were 11 deaths in five months where shooter was 3 to 6 years old. So not only is America full of gun owners, it’s full of irresponsible gun owners. 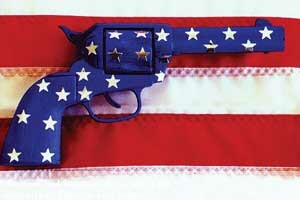 It makes me wonder is there something particular or unusual about American gun culture? The answer, based on this comparative data from the international Small Arms Survey, is yes. American gun ownership rates are positively unparalleled. We don’t just have more guns that anyone else (270 million privately held firearms) we have the highest gun ownership per capita rate in the world, averaging nine guns for every 10 Americans. In comparison – the second highest gun ownership rate in the world is Yemen; a conflict-torn Arab nation still dealing with poverty, political unrest, a separatist Shia insurgency, an al-Qaeda branch, and the aftereffects of a 1994 civil war. Those who embrace the gun culture cross all demographic and political lines. Why are Americans so deeply attracted to firearms and why do guns inspire such passion on all sides? If you look at the history of America and how it was formed, guns played a big a part. You had to have a gun to live in the wilderness, and that has been ingrained in a lot of people…it becomes part of their ‘heritage’. But the recent history of guns in urban America is about people shooting people. After the shooting deaths of 20 children and six adults at Sandy Hook Elementary school in Newtown, Conn., many called for more thorough background checks, more safety training for gun owners and technological innovations to make guns safer. 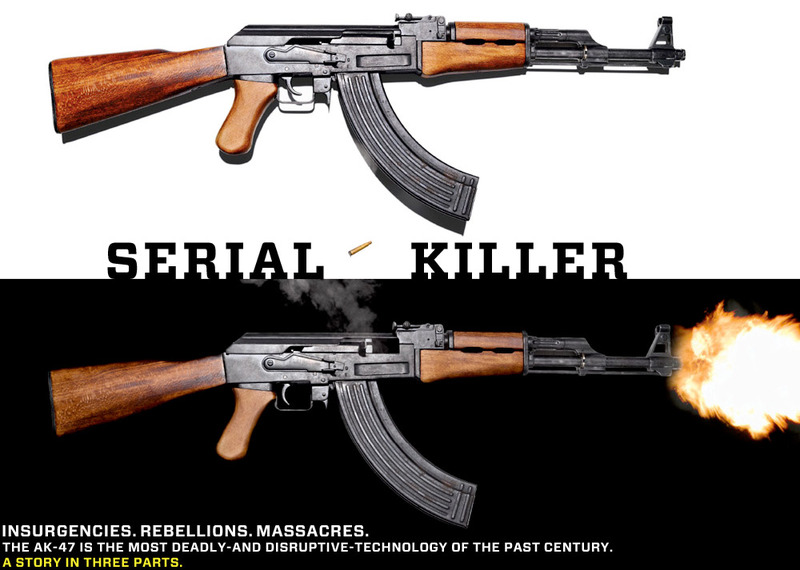 A ban on “military-grade weapons” was included – and large capacity magazines – for weapons that serve only one purpose: to kill a lot of people, real fast. Sounds reasonable right? Gun violence is now costing more lives than drunk driving (maybe because the government has taken actions against drunk driving, but has until now, ignored gun violence). More than 31,000 people a year in the United States die from gunshot wounds. Since the victims are disproportionately young, gun violence is one of the leading causes of premature mortality in the U.S. There were an estimated 337,960 nonfatal violent crimes committed with guns, and 73,505 persons treated in hospital ER’s for non-fatal gunshot wounds. With statistics like this, we should be able to talk reasonably about gun reform…we are not. Debates about gun control often degenerate into heated arguments about restricting gun ownership. I can’t think of an instance in which “gun rights” — the rights of people to buy, own, and carry pretty much any gun and in many cases any number of guns they want — did not dominate debates about gun policy. This is because there is a certain sector who thinks the government is ‘coming after their guns’. The Second Amendment is held up as proof of America’s inalienable right to own guns. But with rights come responsibilities. “Along with our freedom to live our lives as we will comes an obligation to allow others to do the same. We don’t live in isolation. We live in a society, a government of, and by, and for the people” (President Obama). So who is pushing these falsehoods? Three letters: NRA. The NRA is the front group for American gun dealers & manufactures and lobbied hard for a 2005 law that gave gun dealers & manufactures protection from lawsuits not given to other industries. The Protection of Lawful Commerce in Arms Act prohibits suits against gun dealers and manufacturers “for the harm caused by those who criminally or unlawfully misuse firearm products.” It applies not only to federal courts, but also actions at the state and local levels. The NRA played a major role in securing passage of the law, even over the American Bar Association, which had argued the law would infringe on the right of Americans to seek redress in the courts. 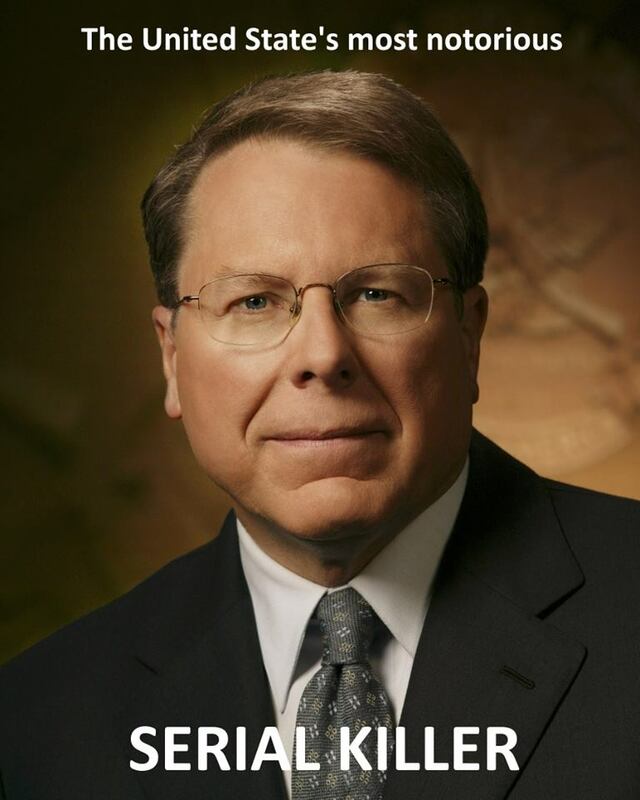 NRA Executive Vice President Wayne LaPierre called it “the most significant piece of pro-gun legislation in 20 years,” adding that “history will show that this law helped save the American firearms industry from collapse under the burden of these ruinous and politically motivated lawsuits.” Right – In 2012 guns and ammunition manufacturing annual revenues were at $11,000,000,000. Gun owners are not by definition criminals, of course. But guns are dangerous weapons if they are in the wrong hands or if there is an accident. Even a Fox News poll finds that 85% majority of voters favor requiring background checks on all gun buyers, including at gun shows and private sales. That includes most Democrats (90%), Republicans (83%) and independents (82%), as well as most of those living in a gun-owner household (81%). Yet our congress has stalled, even refusing to bring the measure to a vote in the House of Representatives. You would think reasonable people could arrive at reasonable solutions, but this is the new status quo for these United States, where money and special interests outweigh public opinion and safety. It seems that the power wielded by the NRA and their deep pockets (who threaten to primary those who DO vote for gun reform) are more of a concern to our elected officials than doing what’s right for America and America’s children. Time to re-boot America. Once again an article full of lies. They make emotional points based on those lies. By far, the majority of gun owners are safe with their guns and good people. It’s the stupid or bad gun owners we have to be careful of. It’s impossible for a gun to shoot a bullet without a person to pull the trigger. The question is; are they a good person or bad? Once again, someone misses the entire point of the article. Why if you are so responsible, would you object to simple measures, like background checks, that would help keep guns out of the hands of irresponsible owners? Stop making the NRA rich – THEY are the ones spreading lies. For instance, how they cried against the possibility of the government creating a National Gun Registry when all along it was Wayne LaPierre and the NRA who DID create such a registry and have been for YEARS. Wake up. Please, Mr. Shill for the NRA, name even ONE lie in the article. For that matter, even one exaggeration. You’re the typical right-winger who makes a dumb comment with NOTHING to back it up. Thank you Ray, I take special care to present factual information but I admit I have a Liberal Bias. Just a suggestion, Mr. Here & Now: Your blog is extremely hard to read. Perhaps a smaller font and clear paragraphs would help. But your message came through. 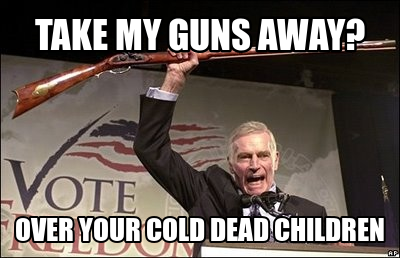 Cling to your guns and I will cling to my ideals. Sorry! That was meant for “Bruce”. I hit the “reply” to him. 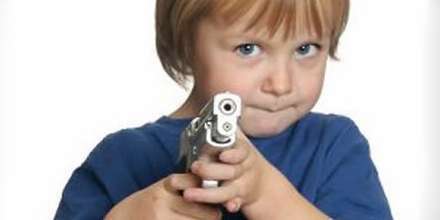 GunFAIL XXXV The child victims of GunFAIL this week were ages 2, 3, 5, 9, 10 and 11, and included the three-year-old girl killed when she found her father’s gun during a camping trip in Yellowstone National Park. I fully support the measures outlined. These absolutely should be no issue whatsoever for responsible Gun Owners. I cannot begin to understand, WHY, if it will save lives and allow for the safer, more responsible and accountable gun ownership, ANYONE would have an issue with the legislation? The protests make no sense what-so-ever.